Why Job hunting is Stressful? Not all are ones, who are the toppers and have an excellent qualification under their belt. They know, they will be welcomed anywhere they approach. However, these groups of individuals are exceptions. Most of us belong to the average category and some below average. Finding a reasonable job can be an uphill task for most of us, and if things are not our way, life can be even more difficult. What are the Steps for Hunting a Job? Waiting for their reply. These are anxious moments, when you are anticipating a response at the moment, when you don’t get one, stress starts to mount up. On the day of the interview, no matter how seasoned you are, you are sure to experience butterflies in your stomach. This can cause stress and jeopardize your interview. Having gone through all these steps, if you are expecting a favorable outcome, then you are certainly not asking for too much. However, if it turns out to be otherwise, then it can have damaging effects. It is not only because you have failed, but also due to the fact that you will have to start the process all over again! The fact that you couldn’t succeed despite of putting in so much of effort can generate a serious amount of stress. Of course you do. 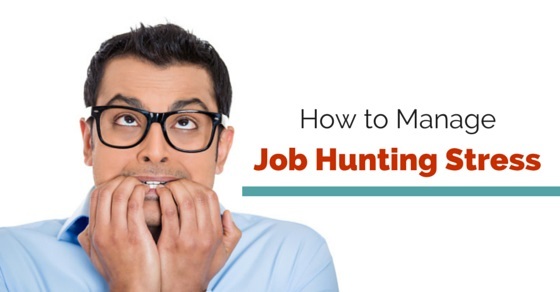 It is true that the process of job hunt itself is quite stressful; however, often people invite more stress by letting them fall prey to the situation. This phenomenon is more visible in case of youngsters and fresher. How do they add more stress to themselves? It is by thinking too much. People allow a lot of useless and irrelevant thoughts to get hold of their mind. What if they reject my application? What if I don’t meet their criteria? Am I good enough for this job? These are the few of innumerable useless questions which keeps on popping in. And to make things worse, people tend to entertain them and they keep on dwelling on them. This doesn’t help a bit, instead they are confusing and would finally lead you to a negative conclusion. This is what makes life even more difficult. How important it is to keep the Priorities Straight? If you allow stress to go beyond your control, then it can seriously affect your effort for the job hunt. Those who have been successful have focused on their goals, kept their priorities straight and under no circumstances they would have allowed themselves to distract from their set path. This is one important factor which helps you keep stress away. If you don’t have a set goal or if you tend to get distracted, then you get confused and confusion can generate a huge amount of stress. The reason why confusion can generate stress is because it will keep on misguiding you, you feel unsure about yourself. Any attempt you make to get things in order would be an absolute failure. Therefore, one of the most important criteria to experience stress-free job hunting is to know what you want, how you can achieve them and what the chances of achieving them are. The moment you get answers to these questions, everything will automatically start falling in place. It means you must get your acts together and get yourself prepared for a call at any point of time. Doing exercise regularly can help drain out the negative energy and make you feel more refreshed. Healthy eating is a must. Avoid junk food, too much of caffeine and alcohol; all these generate stress. It is very important to have adequate amount of sleep. The idea is to reset your brain to its normal condition, which is already in a state of bother. Record all your activities related to job search. It would help you understand how much effort you are putting in. They are the ones who have been through this phase and know all about it. They would help you understand about the situation you are in and it can certainly help you calm down to a great extent. Don’t go for too many options at the same time. It can be confusing, which would eventually lead to stress. This is a very important factor. Appreciating yourself would certainly help you feel more energetic and you would feel the urge to put in more effort. Remember you have some limitations. No matter how much you aspire, you cannot achieve it right from the word go! Therefore, it is always advisable to stick to the skip, hop and jump policy. This is particularly applicable for a fresher who is overexcited and wants to achieve everything in a single go! Before you start your hunt, must have a very clear understanding about the nature of the job market, particularly in your domain. What are the numbers of vacancies available, what are the required experience and qualification levels? Do you have enough options in your home town? These are some of the important aspects which you must take into consideration. It will help you approach your job hunt in a more systematic manner, which would help you reduce the volume of stress. These are a few tips which would help you adjust yourself to the stress which you are bound to encounter during the process of your job hunt. All these tips are suggested by the experts who have done extensive research on this subject. They are of the opinion that your job hunt becomes far easier if you approach it in a well planned and organized manner. If you are wondering what being “easy” has anything to do with it, well, it helps you remain stress free! How to Deal with Job Search Anxiety? As far as your job hunt is concerned, you must have a long term plan in place. The reason why it is important to have a goal term plan is because it might take several days or even months to reach your objective. Once you have set a time limit for you within which you wish to find a job for you, it is time for you to explore various options which could lead you to a successful job hunt. Explore your contacts; keep an eye on the job market. The reason why having a proper and well formulated plan in place is important because it gives you a clear idea about your moves and you can always resort to multiple options if one of them doesn’t produce favorable results. Make sure to stick to your plans. You can certainly modify and make changes as and when required; however, you must never give up. The moment you give up, it will suggest that your stress has got the better of you. If you keep putting in efforts against all the odds, that would give you immense pleasure and satisfaction. It will act as a confidence booster and will help you to get rid of the stress. As already mentioned, it is very important to maintain a realistic approach. You may dream big, that’s not an issue; however, don’t let your dream cause any obstacle. Remember, as an individual, you have your own limitations. You might end up achieving your dream at a later part of your career; for the time being, be realistic and stick. It is very important that you had a very clear idea about your strengths and weaknesses. Don’t jump the gun and try for something which is practically beyond your reach. One of the most important factors which helps to get rid of stress. Maintaining a positive approach would help you fight against all the odds . Positivity is a very effective weapon to fight against stress. It makes you mentally strong and helps you to continue as long as you don’t reach your destination. Job hunting can be a continuous process. It is absolutely essential that you preserve enough energy to wake up the next morning on time and be on your way. In order to achieve this and maintain continuity, it is very important that you pay attention towards your physical well being. Do not compromise on your sleep. Lack of sufficient amount of sleep will raise your level of anxiety and add to your stress. Seek help among your close associates. Your family members and friends would be the perfect option for you. Not only they will help you with proper guidance but at the same time they can help you settle down and start all over again. If you are aimless and looking to grab any option which comes your way, then it can leave you in a state of utter confusion. Therefore, it is highly recommended that you set your target and concentrate on it. Well, job hunting has always been stressful. However, there are ways to encounter this stress and also to get rid of them. These stress management tips can certainly help you remain relaxed and tension free during your days of the job hunt. Previous articleJob Search Priorities or Goals – How to Set them Right? Next articleHow to Overcome Lack of Self Discipline?